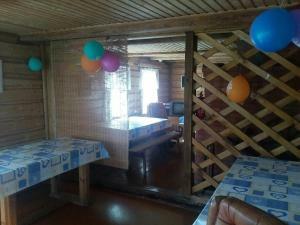 A-HOTEL.com - Luxury and cheap accommodation in Yanega, Russia. Prices and hotel, apartment booking in Yanega and surrounding. Cottage Complex ''Uiutni Prichal'' is offering accommodation in Svir'stroy. All rooms boast a flat-screen TV with cable channels and a private bathroom. Featuring a Vodka Museum, a zoo and a pancakes bar, this holiday village is situated on the Svir River, 33 km from Podporozhye town. Rooms are decorated in traditional Russian style. У Максимыча is offering accommodation in Podporozh'ye. Boasting a 24-hour front desk, this property also provides guests with a restaurant. Offering a barbecue and views of the river, Cottages in Plotichno is located in Plotichno in the Leningrad Region Region. Free private parking is available on site.